Memphis, the capital of the Old Kingdom (2686-2160 BC) was a magnificent city and important, both as a commercial hub, as well as a cult centre for the god Ptah, creator of the universe. The temple of Ptah was Memphis’ most impressive building. Unfortunately, it was destroyed a long time ago like other temples dating back to the time as they were then made of mud-bricks. Memphis today is a pleasant open air museum; the main attractions a colossal statue of Ramses II as a young king and a New Kingdom sphinx. Two kilometres from Memphis, in the bleak golden dunes of the desert, lies the necropolis of Saqqara, the burial ground of the Old Kingdom pharaohs and nobles. The Step Pyramid of Djoser is the largest funeral complex in Saqqara. It was constructed for the pharaoh in 2650 BC by his architect and vizier Imhotep, also a renowned writer and physician. Standing 60 meters high, the Step Pyramid was not only the first pyramid to be built but also the first stone building to be ever constructed. The earliest dynasties built their tombs below the ground and had them covered with mastabas, mounds made of mud-brick and plaster. The Step Pyramid was primarily a series of six mastabas made of small blocks of stone laid like bricks set on top of the other and covered in shiny white limestone. A 28-meter shaft leads into the burial chamber which is now blocked. The pyramid is surrounded by a vast rectangular complex enclosed in a limestone wall. Within is the Heb Sed court, now completely rebuilt, which was the site for the five-day Heb Sed festival held in Memphis every 30 years of the pharaoh’s reign. Symbolising the renewal of the king’s vitality, all the rituals were performed twice, once as the King of the South, and thereafter as the King of the North. Officials from all over Egypt came to witness this ceremony and show their allegiance to the pharaoh. The Pyramid of Unas, in Saqqara, is small but noteworthy for its burial chamber in which are hieroglyphic inscriptions known as the Pyramid Texts. They are the first written versions of the ancient funeral ritual chants from which the Book of the Dead was later derived from. 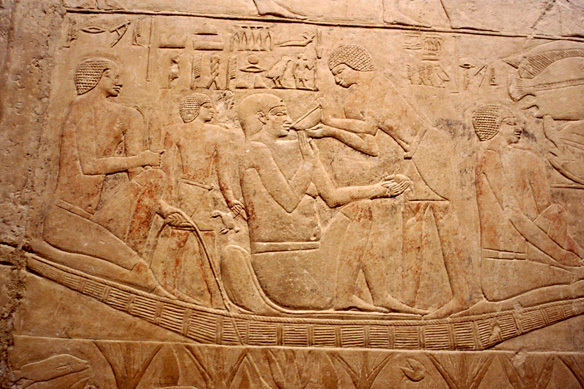 Apart from the pyramids, Saqqara has a number of tombs or mastabas built by the Egyptian nobility. The mastaba of Mereruka is the largest mastaba in Saqqara with around 32 rooms. The decorations on the walls consist of lively scenes of hunting, farming, dancing and funerary rituals. Other mastabas of interest are those of Ptah-hotep and Ti. The Pyramids of Giza, one of the seven wonders of the ancient world, are the only ones to have survived through time. Pyramids, or Houses of Eternity, as they were called were built as huge, impregnable tombs designed to protect the mummy and provide accommodation for the visiting ka. For the Egyptians to have conceived the idea of the pyramids was creative, but to have executed them was heroic. It took superb skill and organisation to cut rock with the simplest of tools and to move massive blocks into place with mere muscle. 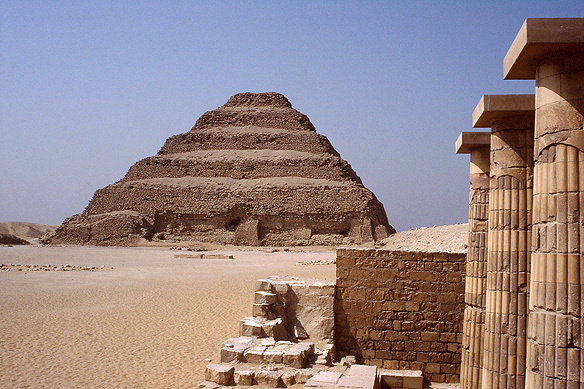 Built during 2500 BC, the pyramid complex of Khufu, Khafre and Menkaure consists of nine main pyramids and a number of mastabas, valley temples and mortuary temples in which rituals and offerings were made to the dead. In ancient times the pyramids were covered in shiny, polished limestone and painted in vivid designs and colour like all their other monuments. 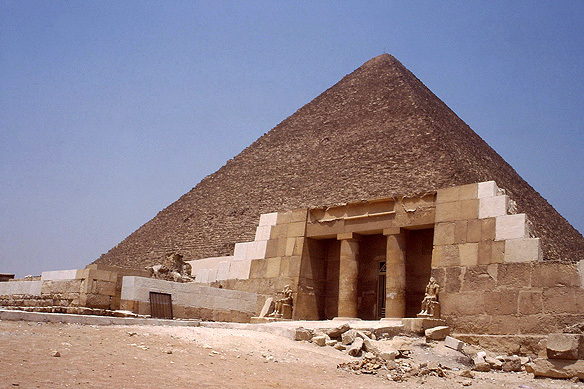 The Great Pyramid of Khufu is the oldest and largest pyramid in the group. Built with around 2.3 million limestone blocks, each block weighs an average of 2.5 tonnes. Originally 147 meters high, the loss of its limestone covering and capstone has lowered it to 137 meters. A long, narrow and low corridor leads through the magnificent 47-meter long Great Gallery into the main undecorated king’s chamber. The sarcophagus lies empty, the mummy was never found. The Egyptians had studied the skies, identified many of the fixed stars and were able to calculate the movement of the others. When they laid out the pyramids, they determined the axis with the stars, aligning it with the three stars of the Orion, the constellation of Osiris. The Great Pyramid of Khufu is laid out such that its slopes face the north, south, east and west exactly. A dismantled solar boat was found in the boat bit outside the pyramid. It is now housed in a special museum at the site. A second solar boat, perfectly preserved, still lies under the sand. Standing in front of Khafre’s pyramid is the Sphinx which is over 20 meters tall and 60 meters long. 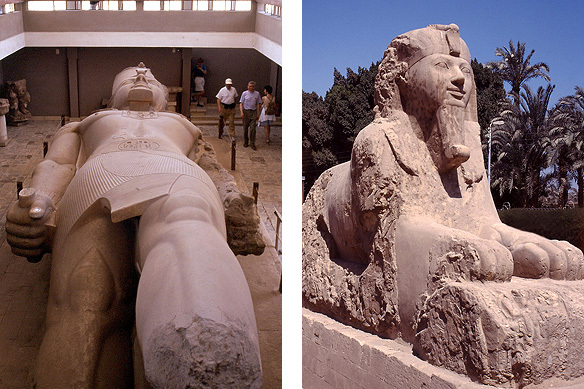 The sphinx, half-lion and half-human was considered to be an embodiment of Hermakhis, a manifestation of the sun god. Tradition suggests that Khafre found an outcrop of rock and had the sphinx carved on it, the face fashioned in his own image. A stele put up by Thutmose IV (14th Century BC) between its two paws tells the story of how Thutmose IV had dreamt that if he were to clear the sands surrounding the sphinx he would be crowned king, a dream which came true. After sunset, a sound and light show is held every evening. The setting is spectacular and cannot fail to impress. As the pyramids turn colour in the setting sun and the stars pin up the sky, the sphinx accompanied with music and a laser show recounts the story of the pyramids and the ancient Egyptians. This entry was posted in Egypt, Exploring our World and tagged Ancient Egypt, Book of the Dead, Cult of Ptah, Great Pyramid of Khufu, Heb Sed Festival, Houses of Eternity, Mastaba of Mereruka, Memphis Capital of Old Kingdom, Pyramid of Unas, Pyramid Texts, Pyramids of Giza, Ramses II, Saqqara Necropolis, Seven Wonders of the Ancient World, Sphinx as Hermakhis, Step Pyramid of Djoser, Story of the Sphinx, Things to see in Egypt, UNESCO World Heritage Site by Rama Arya. Bookmark the permalink.